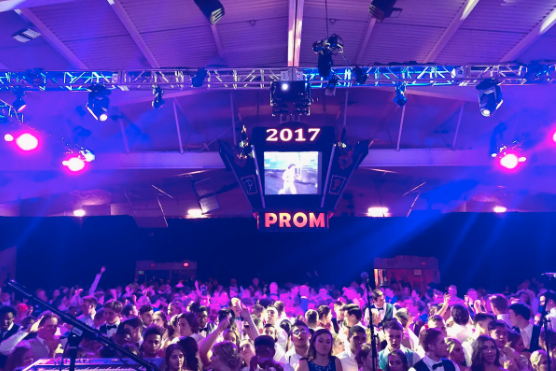 Pennsbury High School's prom has been dubbed the Best Prom in America. Last year, DJ Pauly D and Questlove of The Roots performed. Pennsbury High School in Bucks County takes its reputation as the Best Prom in America very seriously. It's continuing the tradition this year by bringing in DJ Pauly D and Drake Bell to perform at the festivities. Don’t ask how they do it — or why, for that matter — but celebrities have always come to this suburban Pennsylvanian high school to perform at prom. We’re talking to John Mayer, Ryan Cabrera and Pennsbury alumnus Asher Roth. They deck out the school with decorations. They throw an enormous parade with floats. It reportedly has a six-figure budget. Like, what?! A 2005 book was made about this prom called “Wonderland: A Year in the Life of an American High School” that was in the works for a movie. And Entertainment Weekly called it the “Oscars” of prom. I mean, it’s all a bit out of hand. This year’s theme is the "Great Gatsby" and somehow Pauly D and Drake Bell were declared perfect for that. Originally they recruited Questlove of The Roots for their Philly-themed prom, but he backed out three days before. There were a lot of angry teenagers at Pennsbury High School that week. How could he? Once Pauly heard of the shocking news, he decided to step in. But then, Questlove rejoined the party anyway. So they both performed. Best Prom in America wins again. So anyways, thank goodness things are all good between Questlove and Pennsbury. And Pauly D offered to come back and perform for the second year in a row, so that's another big win. Bucks Local News reported the DJ has even made a new set just for the event. Sidenote: Who knew Drake Bell was still a thing? It’s been a while since I checked in with Bell, but he released a new EP this year. Bell is known for his role as Drake Parker on the show “Drake and Josh” on Nickelodeon. If you grew up watching Nickelodeon, there are endless jokes I could make about this. Here’s a sampling. Who got @DrakeBell to our prom....?